We have updated the Summary view to provide more details on your campaign performance. #1 days lead Type chart = Is a pie chart that represents your leads by source. 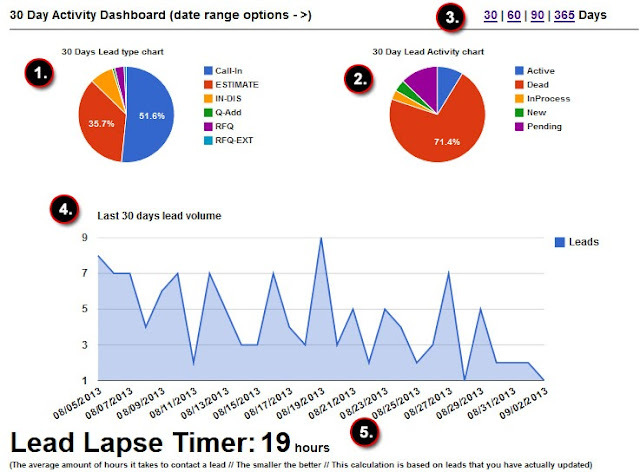 #2 days lead Activity chart = Is a pie chart that represents your leads by activity. #4 lead volume by day. #5 is the lead lapse time. Excluding leads that have not been updated or ones tat are flagged as bad this is the amount of time in hours to show you the average age of a lead within the system before it is managed. This number should be fairly low. The sooner you take an action on a lead the better your time will be and the more opportunities to sell your service.